For Michael, the challenge in oil painting is to capture the special "Look at that!" moments we all experience every day. The play of light on a subject is the key element in each of these moments. 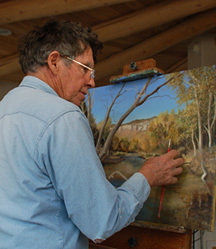 His painting is inspired by the area in Southwest New Mexico where he has lived for the past eleven years. Michael's background and professional training are in geology and the natural sciences, so much of his work focuses on nature, or at least contains aspects of nature. In most cases, though, it is the way light illuminates a subject or a scene, invoking a certain response, emotion or connection to that special moment, that inspires him to begin a painting. Michael prefers to paint with oils because of their unique glazing capabilities, which are so effective in capturing the ephemeral and the brilliant play of light on a subject. His paintings generally consist of several built-up layers of paint, each one creating depth and allowing the light to shine from within. Most paintings can have four or more layers of paint, each of which has been diluted and suspended in a transparent glazing medium. This process is slow, and when combined with the relatively realistic approach he takes in his work, results in paintings that are quite time consuming to produce. Michael has had some formal instruction in painting, but most of his training in art, and in oil painting in particular, is self taught. His drawing skills were acquired during many years of professional involvement in scientific and technical illustration as a geology professor at the university level. Learning to draw well was the most important step in his develoment as a painter. While Michael has painted off and on since high school, it was not until he and his wife, Becky, spent seven years living and working in Southwest Ireland that he became serious about pursuing his art. The beauty of coastal Ireland is, of course, legendary and in his case worked its magic well, for it was there that he began painting in earnest. 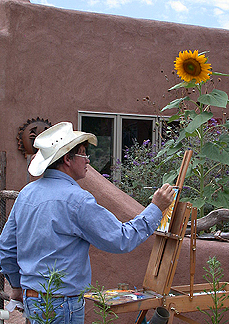 When he and Becky returned to the United States in 1998 and moved to New Mexico to open Casitas de Gila Guesthouses on Bear Creek in Gila, he found that the incredible light of New Mexico intensified his urge to paint. Today he finds himself painting more than ever, and enjoying it immensely. Michael's paintings are currently hanging at the Art Gallery at Casitas de Gila Guesthouses in Gila, New Mexico.